Officers Dustin Boone, Randy Hays, and Christopher Myers of the St. Louis Metropolitan Police Department (SLMPD) were indicted by a federal grand jury in connection with the assault of a fellow officer who was working undercover. Officer Bailey Colletta was indicted for providing false statements to a federal grand jury in connection with the incident. Chris Myers was given an additional charge of destroying evidence. 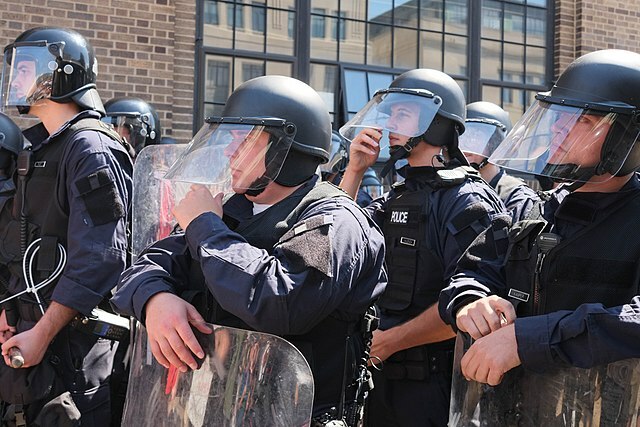 In September 2017, all four officers were assigned to a Civil Disobedience Team, which conducts crowd control, prior to the large-scale protests against the acquittal of Anthony Stockley. In 2011, Officer Stockley fatally shot a black driver, Anthony Lamar Smith, after a police chase. Stockley claimed he was acting in self-defense because he believed Smith was reaching for a gun. Prosecutors argued that Stockley planted the gun to justify the shooting. When Stockley was acquitted in 2017, St. Louis protestors took to the streets. St. Louis Police had an officer, known as L.H., work undercover among the demonstrators. L.H. had been with the Department for 22 years prior to the Stocklety protests. He wore a shirt that revealed his waistband so that he would not be mistaken for being armed. The indictment alleges that Boone, Hays, and Myers attacked L.H. by throwing him to the ground without probable cause, and then kicking and striking him with a riot baton. When the indicted officers learned that L.H. was a fellow officer working undercover, they tried to cover-up the incident by destroying L.H.’s cellphone, making false statements in their incident reports, and tried to intimidate L.H. and the witnesses who saw the incident. The DOJ claims L.H.’s assault is an attack on his civil rights. The officers each face 10-30 years in federal prison. All face a maximum of $250,000 in fines. It is alarmingly that police officers would not only plan to attack people, but that they would cover it up. There is been a lot of talk lately (perpetrated by the White House) about whether lying to the FBI or Congress is a crime. Of course lying to investigators is a crime, and a serious one at that. If a crime is committed, then the government’s responsibility is to punish that crime. Lying to investigators is obstruction of justice because it impossible for the government to carry out its responsibility to punish wrongdoers if the government doesn’t have all the facts available. To be sure, conflicting testimony is not always lying. Sometimes people misremember what occurred or they might remember things different later on. Human memory is a fickle creature. Conflicting testimony is a lie though if it is clear that the conflict exists to prevent the truth from coming out. There are a few methods of determining whether conflicting testimony is actually a lie and this case illustrates a few of them. First, the officers took other actions to conceal the truth other than giving conflicting testimony. The officers destroyed L.H.’s cell phone and attempted to coerce witnesses into silence. These actions indicate that conflicting testimony was intended to mislead the grand jury. Second, multiple conflicting accounts can be another indication that differences in sworn statements are actually lies. The details of the case should not change radically from one interview to the next three or four interviews. Does It Matter that the Victim was an Undercover Police Officer? The unique and strongest theme of this case is that L.H. was another officer doing his job when he was attacked by his co-workers. It is unlikely that L.H. would be triggering violence that would require Myers and friends to beat him. Given the text messages discovered, it is much more likely that Myers and Boone were looking for vulnerable targets and ended up picking another officer. Determining the punishment of those who break the law is the responsibility of the judiciary. Myers and company not only attacked potentially innocent people, they also violated the separation of powers that is at the heart of American governance. Myers and Boone would have been abusing their authority regardless of whether their victim was another officer or a protestor. Similarly, it shouldn’t matter that Myers and Boone were also police officers. If a defendant would be given a higher sentence for assaulting an officer, then Myers and Boone should be subject to the same enhancements. If assaulting an officer is a crime, it shouldn’t matter that the people beating said officer were police as well. Of course, Myers and Boone could argue that they didn’t know that L.H. was an officer, but that raises a more disturbing issue. Ironically, Myers and Boone are proving the protestor’s point. Although many police officers are merely doing their jobs, like L.H., local departments have employed people who have no business being officers. Meanwhile, officers like Bailey Colletta are covering up those abuses and blaming it on innocent people. If America really wants movements like Black Lives Matter and the NFL flag kneeling protests to stop, then police officers like Myers and Boone need to be held accountable. The only respect a government can have is the respect that they earn by taking right and morally just actions.